My guess is sales are down because people don't want to be patronized by the coffee shop they are patronizing. (AP) Starbucks baristas will no longer write “Race Together” on customers’ cups starting Sunday, ending as planned a visible component of the company’s diversity and racial inequality campaign, according to a memo. The coffee chain’s initiative will continue more broadly without the handwritten messages, Starbucks spokesman Jim Olson said. 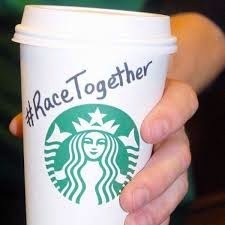 The cups were always “just the catalyst” for a larger conversation and Starbucks will still hold forum discussions, co-produce special sections in USA TODAY and put more stores in minority communities as part of the Race Together initiative, the memo from CEO Howard Schultz said. The campaign has been criticized as opportunistic and inappropriate, coming in the wake of racially charged events such as national protests over police killings of black males. Others questioned whether Starbucks workers could spark productive conversations about race while serving drinks.